How I addressed it. Had to touch on the code issue because that was the issue. "The crawl space is considered to have inadequate ventilation by today's standards for new construction. We counted four vents for the entire crawl space. Today's standards for new construction, the 2006 International Residential Code (IRC), require ventilation openings of not less than 1 square foot for each 150 square feet of crawl space and 1 vent within 3 feet of each corner of the building. A 1500 sq. ft. crawl space, for example, would require 10 sq. ft. of ventilation. The size of the average vent is 16 x 8 inches. Therefore, a 1500 sq. ft. crawl space would require approximately 11 average size vents. We did not conduct sizing calculations on this home. However, the 2003 IRC may have been in use when the house was originally permitted. The 2003 IRC, which most jurisdictions no longer use, allowed ventilation to be reduced to 1 sq. ft. for each 1500 sq. 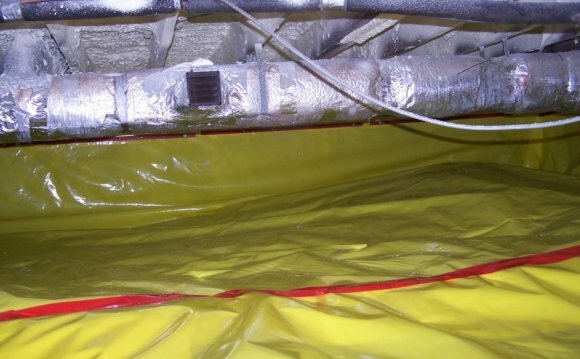 ft. of crawl space provided a 100% vapor barrier was installed. You should inquire with the local building code enforcement authority and the builder to determine which rules were in place at the time of permitting this home. Our view is that a home of this size with only 4 foundation vents is atypical (in 4 years, as a professional home inspector we have never seen so few vents in a new home) and we do not endorse this building practice. The moisture content in the wood structure was well within acceptable limits at the time of the inspection (not unusual for the low humidity conditions of winter months). Inadequate ventilation can lead to high moisture content in the wood floor structure, which can contribute to the fungi growth and decay in the long term and you are advised to monitor the conditions in the crawl space over the course of ownership, particularly during the humid summer months. You may wish to consult with a crawl space specialist or licensed general contractor for a second opinion." the love of soft living, and the get-rich-quick theory of life. Angie's List Super Service Award Winner 2013, 2012, 2011, 2010.